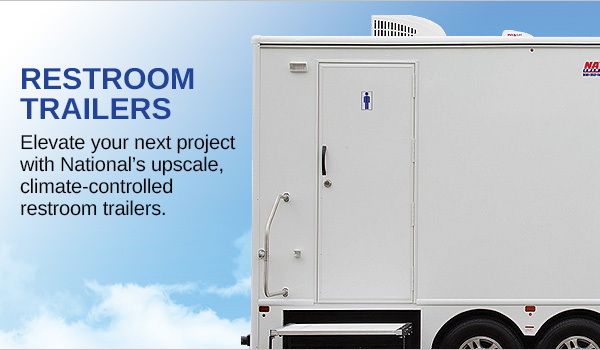 Restroom trailers are a roomier and upscale version of traditional portable toilets. National Construction Rentals offers a variety of restroom trailers, from basic to upscale, and with options for commercial use to black tie affairs. 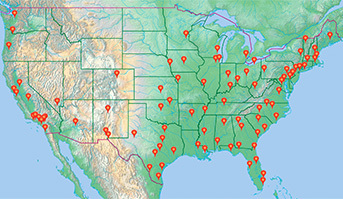 These are available in Atlanta, Chicago, Dallas, Houston, Los Angeles, Orange County, Philadelphia, Phoenix, Riverside, San Antonio, San Bernardino, San Francisco, San Diego, San Fernando Valley and San Jose. Our restroom trailers come equipped with all the comforts of home … heat for cold weather climates, air cooled for warmer weather. All National restrooms trailers offer well-lit interiors. While some are basic, others offer an upscale and first class atmosphere for special occasions. Each restroom trailer has interior lighting, spacious stalls and urinals. Our higher-end models include dual sinks, vanity mirrors and more.